This scroll was done in co-ordination with Photographer and Gallery owner Nathan Wotkyns. He took this picture near Gunlock, which is a 40 Minute drive north of St. George, Utah. during the floods that ravaged Southern Utah in 2005. Nathan Wotkyns was able to get into the Gunlock area before traffic was detained by the police department. This resulted in a beautiful rainbow over a rushing waterfall. In the past, it was stated that the Hyousoushi must look at the work and try to determine how the scroll design can complement the work. 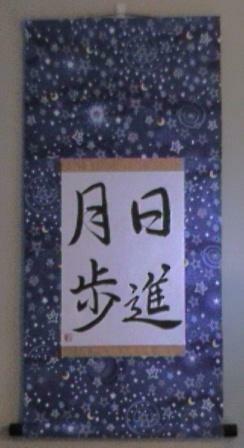 I felt that a two-step scroll (Nidan Hyougu) would be the best match for this photo. I wanted to use the gold Chumawashi (Gold cloth that borders the work) to help complement the colors of the surrounding trees, but also to help bring to the forefront the faint rainbow as the centerpiece of the work. The white used has two symbolisms. One, it is used to extend the color of the waterfall. Meaning that although the water ends in the photograph, it is visually continued in the Ten and the Chi of the work. Secondly, this picture was taken in the late fall, and hence to help one remember the crisp, cool winter weather approaching. The Jikusaki are a beautiful ceramic pink with white flecks evoking the image of snowflakes and hence continuing on the winter theme in the white cloth. The kakehimo is a beautiful gold which is similar to the color of the Chumawashi. Have you ever been interested in what your name could mean in Japanese characters. Let Yoshimi's creative mind produce a beautiful colloquial expression in Japanese. 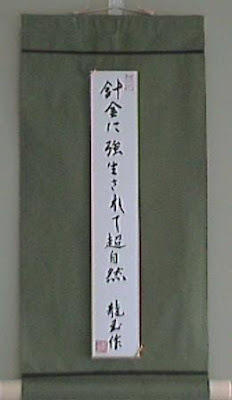 Our cost for such services are very minimal, and you can always have it written on a Shikishi or put into a scroll and hung in your home or office. 紅炉一点雪 This is read Kouro, Itten No Yuki. The fate of our setting in life makes all things equal. Some snow falls on the ground, and some snow must be consumed as it falls onto the fire. Life is filled with contrasting opposites. There is the snow which is cold, white and is in constant movement, versons the hot, crimson and stationary setting of a fire in the fireplace. Where we fall is not up to us to decide, but is contingent upon fate. The snow that helps create the ground's winter blanket is equally as beautiful as the individual flake consumed by the fire and becomes a droplet of steam. So let us all rejoice in our individual circumstances as winter approaches and reflect upon the beauties that surround us in all different forms. These characters were submitted for monthly progress with Yoshimi's calligraphy society. She really liked this phrase. It means that we can improve little by little a day at a time. Sometime's in life we feel that we may be very frustrated with our own lives. Perhaps our plans or expectations have not come to fruition. It should always be recounted the little steps that were taken to accomplish the obstacles in front of us are the greatest journey. This was written in a semi-cursive, gyousho style. I selected this cloth because it matched the symbolism of the charcters Sun 日 and Moon 月 The characters on the bottom have been separated, but written together as such 進歩 it reads Shinpo or progress. We should always wish upon a star once in a while and then walk in the day to get accomplished our tasks. This beautiful Maru Hyougu stlyle scroll is for sale and it is accented with black plastic Jikusaki and Gold Kakehimo. This work was done on a shikishi mat board. It is the character for Journey, also called Tabi in Japanese. This is written in a Semi-cursive style called Gyousho and will complement the Shikishi Kake scroll that this customer ordered perfectly. As a last thought, as we journey through life we should take to time to enjoy that which edifies and inspires us. This haiku was created by my wife. Her ability to manipulate characters to derive meaning is truly a gift. This is how it reads...Sorry, but you will need to install the East Asian Language pack to read the Japanese. The beauty in this poem is the change of the character Kyousei. 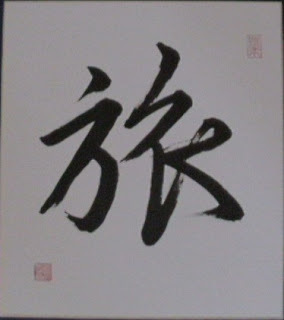 This is typically read as 強制 which means to compel or force. But changing the character to 強生 it transforms the meaning to be that the wire does not compel the tree to bend or shape, but that the shaping of the tree strengthens it's living essence. The beauty of a cascading style bonsai seems greater than Nature itself and hence the last line.